Lovely colours. Best flattery to imitate! Good ideas deserve to be used as many times as possible! I like how feathers look like fabric! I guess from the exif info this was with an extension tube? Very pretty. 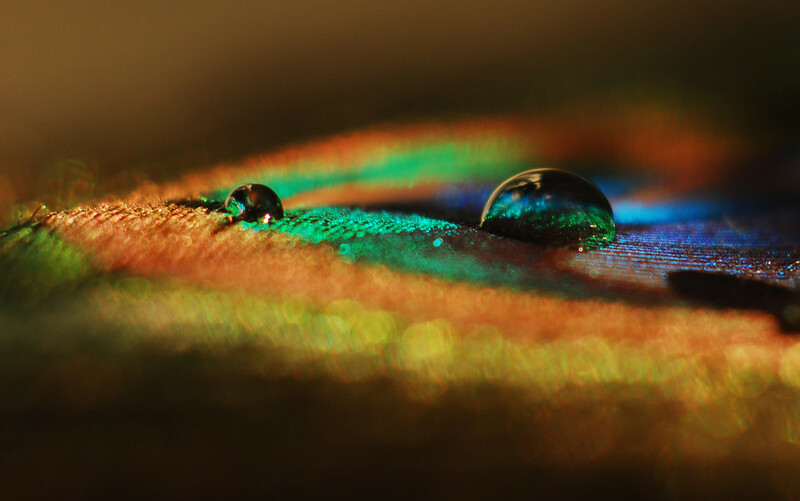 Beautiful micro, colors , drops and reflections. Absolutely fabulous, I love it. fav. This is stunning! The macro effect and colors are fabulous. Fav!! I looked at those photos you modeled and they are gorgeous. Yours came out wonderfully well, too. Spectacular. Looks wonderful on black. Fav. Nice capture. I like the subtle bokeh. Lovely. Isn't it so that all the shots you see is inspiration to create someting of your own. That is superb. Nothing shameful about trying to replicate a shot. Isn't there a saying about imitation being the best form of flattery? Beautiful. And it's great to be inspired by someone else. If I was them I'd be quite flattered. Beautiful colours and droplets. Fav. Wow - I can see why you had to have a go - this is so good - I love the little coloured scene in the water drop. Well done! It's quite an attractive abstract. Magic! Gorgeous colours and drops! @taffy Thanks very much - I hadn't seen the list - so pleased! Congrats on making TT - well deserved! Fabulous image! Well deserving of being on the Popular Page! Congrats on making TT....It's a beautiful image. @pistache Thanks very much - a very lucky fluke!